About every 7.5 minutes, a pedestrian in the U.S. is hurt in a traffic crash.1 While traffic laws generally dictate that law-abiding pedestrians have the right-of-way, clearly, many drivers do not observe this rule. That often means that innocent pedestrians are hit, run over or otherwise harmed in traffic accidents. The Houston car accident attorneys at the Amaro Law Firm are dedicated to helping the victims of pedestrian accidents seek compensation and justice. We represent both pedestrian accident survivors and families who have lost a loved one to a deadly pedestrian accident. During your FREE consultation, we will explain your rights and legal options. Free virtual and mobile consultations are available if you cannot visit our offices. We also invite you to download this Free eBook for helpful tips on how to protect your rights and a potential claim when you may be the victim of any type of auto accident, including a pedestrian accident. 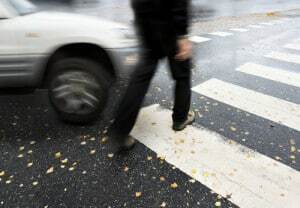 Pedestrian Accident Causes: Who Is Liable for Pedestrian Accidents? Driver negligence – Distracted, drunk and/or fatigued drivers tend have impaired perception and delayed reaction times, making it more likely they will hit pedestrians (because they won’t see, yield to or be aware of them). Drivers may also intentionally violate traffic laws and end up causing pedestrian accidents. Other factors – Anything from poor road conditions (e.g., broken traffic signals) to vehicle equipment failures (preventing drivers from controlling the car) may also play a role in causing pedestrian accidents. Maximizing the financial recovery from your pedestrian accident claim. Deadly pedestrian accidents have been on the rise across the U.S., increasing more than 9 percent since 2014. The national spike in fatal pedestrian accidents has been echoed in Texas, where these deaths have increased nearly 11 percent since 2014. More than 1 in every 5 children (younger than 14) killed in a deadly traffic accident were pedestrians. Alcohol impairment (on behalf of a driver and/or the pedestrian) is a factor in about 48 percent of all deadly pedestrian accidents. About 71 percent of deadly pedestrian accidents happen at non-intersections. When it’s time to recover from a pedestrian accident and seek justice, it’s time to partner with a lawyer at the Amaro Law Firm. Tenacious, experienced and compassionate, our attorneys will work tirelessly advocate your rights, build you the strongest possible claim and position it for success. Making every effort to prove wrongful conduct and recover damages like medical bills, lost earnings, loss of consortium and pain and suffering. While we understand that compensation cannot reverse the permanent losses caused by serious or fatal pedestrian accidents, we also know that these recoveries can provide the means for getting medical care and rebuilding lives. A Houston car accident lawyer at the Amaro Law Firm is ready to advocate your rights to recovery and justice in the aftermath of a pedestrian accident. Call (877) 892-2797, text (281) 612-8024 or email our firm for your FREE Consultation. We can answer your questions and explain how to proceed with your potential claim. At Amaro Law Firm, we are proud to represent the victims of negligence and help them successfully navigate the claims and recovery process. With previous experience in insurance defense, we know how to combat insurers’ tactics for reducing, delaying or denying claims – and we are ready to take a case to trial when that serves the best interests of our clients and their claims. Let us explain how our representation can make all of the difference in the success of your claim.